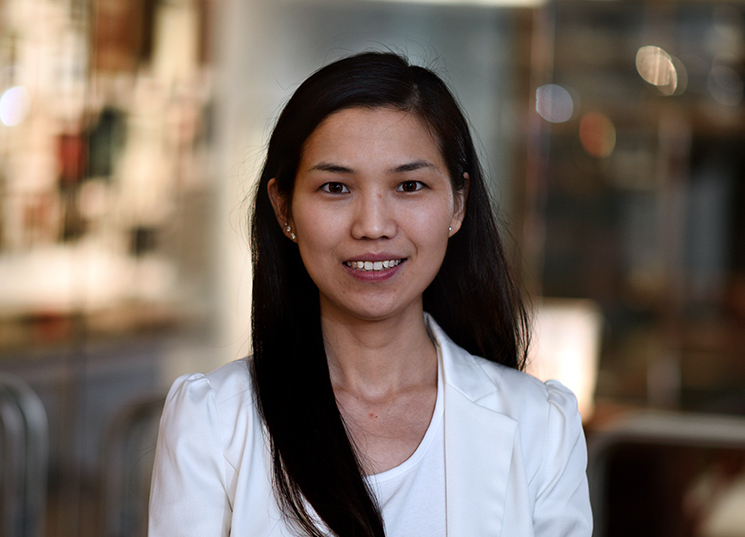 Fenge Li is a postdoctoral associate in the Samuel Lab. She joined the Samuel Lab in early 2017 where she has been focused on researching how microglia mediate synapse pruning in developing retinas. Fenge has a MD in Clinical Medicine from Jining Medical University. In addition she also has a Ph.D. in Cancer Immunology from Tianjin Medical University & MD Anderson Cancer Center (joint degree). Fenge has published in several journals (see below) and has also served as a journal editor. When Fenge is not working she enjoys exploring the United States, traveling to visit family in China and spending time with her daughter Anni. Li F, Guo Z, Wang H. Influencing elements and treatment strategies associated with the relapse of hepatocellular carcinoma after surgery. Hepatogastroenterology. 2013 Jul-Aug;60(125):1148-55. Li F, Guo Z, Lizée G, Yu H, Wang H, Si T. Clinical prognostic value of CD4+CD25+FOXP3+regulatory T cells in peripheral blood of Barcelona Clinic Liver Cancer (BCLC) stage B hepatocellular carcinoma patients. Clin Chem Lab Med. 2014 59(9);1357-1365. Li F, Guo Z, Yu H, Zhang X, Si T, Liu C, Yang X, Qi L. Anti-tumor immunological response induced by cryoablation and anti-CTLA-4 antibody in an in vivo RM-1 cell prostate cancer murine model. Neoplasma, 2014,61(6): 659-71. Li F, Guo Z, Zhang Y, Wang H, Zhang X, Si T, Yu H, Qi L. Postoperative adjuvant arterial chemoembolization improves survival of hepatitis B virus-related hepatocellular carcinoma: a retrospective control study. Ir J Med Sci. 2015 Dec;184(4):753-9. Bradley SD, Chen Z, Melendez B, Talukder A, Khalili JS, Rodriguez-Cruz TG, Liu S, Whittington M, Deng W, Li F, Bernatchez C, Radvanyi LG, Davies MA, Hwu P, Lizee G. BRAF (V600E) co-opts a conserved MHC class I internalization pathway to diminish antigen presentation and CD8+T-cell recognition of melanoma. Cancer Immunol Res. 2015 Jun;3(6):602-9. Qi L, Sun X, Li FE, Zhu BS, Braun FK, Liu ZQ, Tang JL, Wu C, Xu F, Wang HH, Velasquez LA, Zhao K, Lei FR, Zhang JG, Shen YT, Zou JX, Meng HM, An GL, Yang L, Zhang XD. HMGB1 Promotes Mitochondrial Dysfunction riggered Striatal Neurodegeneration via Autophagy and Apoptosis Activation. PLoS One. 2015 Nov 13;10(11):e0142901. DeLyria ES, Zhou D, Lee JS, Singh S, Song W, Li F, Sun Q, Lu H, Wu J, Qiao Q, Hu Y , Zhang G, Li C, Sastry KJ, Shen H. Sublingual injection of microparticles containing glycolipid ligands for NKT cells and subunit vaccines induces antibody responses in oral cavity. Carbohydr Res. 2015 Mar 20;405:87-92. Qu J, Yu H, Li F(Co-first author), Zhang C, Trad A, Brooks C, Zhang B, Gong T, Guo Z, Li Y, Ragupathi G, Lou Y, Hwu P, Huang W, Zhou D. Molecular basis of antibody binding to mucin glycopeptides in lung cancer. Int J Oncol. 2016 Feb;48(2):587-94. Li F, Chen C, Ju T, Gao J, Yan J, Wang P, Xu Q, Hwu P, Du X, Lizée G. Rapid tumor regression in an Asian lung cancer patient following personalized neo-epitope peptide vaccination. Oncoimmunology. 2016 Oct 7;5(12):e1238539. Li F, Du X, Zhang H, Ju T, Chen C, Qu Q, Zhang X, Qi L, Lizée G. Next Generation Sequencing of Chinese Stage IV Lung Cancer Patients Reveals an Association between EGFR Mutation Status and Survival Outcome. Clin Genet. 2017 Mar;91(3):488-493. Guo Y, Wang P, Wang P, Gao W, Li F, Yang X, Ni H, Shen W, Guo Z. Myometrial invasion and overall staging of endometrial carcinoma: assessment using fusion of T2-weighted magnetic resonance imaging and diffusion-weighted magnetic resonance imaging. Onco Targets Ther. 2017 Dec 15; 10: 5937-5943. Nicholas E. Albrecht, Jonathan Alevy, Courtney A. Burger, Danye Jiang, Brian I. Liu, Fenge Li, Julia Wang, Seon-Young Kim, Chih-Wei Hsu, Sowmya Kalaga, Uchechukwu Udensi, Chinwe Asomugha, Ritu Bohat, Angelina Gaspero, Monica J. Justice, Peter D. Westenskow, Shinya Yamamoto, John R. Seavitt, Arthur L. Beaudet, Mary E. Dickinson, Melanie A. Samuel. Integrative and rapid discovery of neural regulatory molecules. Nature Neuroscience (in review). Li F, Guo Z. Treatment of hepatocellular carcinoma with portal vein tumor thrombus. Int J Oncol. 2012; 39(3):225-27. Li F, Guo Z, Yu H, Wang H. Case report: Liver and bilateral renal hamartoma with left renal carcinoma [J]. Chinese Medical Journal.2013, 93(19):1519.